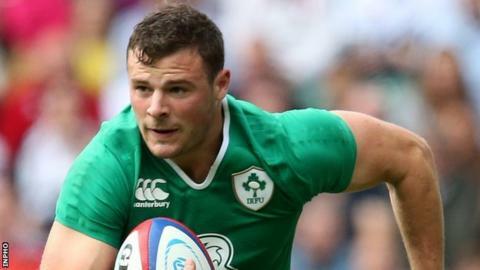 Ireland centre Robbie Henshaw has fully recovered from a hamstring problem and is fit to face Romania in Sunday's World Cup match at Wembley. Earlier in the week Irish management said they were not sure if the 22-year-old Connacht man would be able to play. But on Thursday team manager Michael Kearney reported that all players were 100% fit for the Pool D fixture. Coach Joe Schmidt will reveal his line-up on Friday as Ireland attempt to make it two wins from two matches. Schmidt is keen to give Henshaw and Ulster's Jared Payne time to get reacquainted in midfield. The coach is expected to mix up selection for the Wembley encounter, with one eye on the key battles with Italy and France. Eoin Reddan, 34, is likely to step up to take over from first-choice scrum-half Conor Murray as the Irish coach aims to keep his two number nines fresh. Ireland have only two specialist scrum-halves in their squad, with versatile Leinster fly-half Ian Madigan the emergency back-up. Murray may take a seat on the bench for Sunday's clash with Romania, but says he has prepared himself to play a role in all of Ireland's World Cup matches. "Mentally you have to prepare to be involved in every game," said Murray. "It doesn't change for me or Eoin during the week, we are both preparing for a Test match at the weekend. "If there were three or four scrum-halves in here they would be doing the same thing, because anyone can be called to slot in at any point. "And you have to slot in without disrupting the team." Leinster stalwart Reddan applied ice to his knee after Saturday's 50-7 victory over Canada, but has trained without issue through the week. Reddan is the obvious candidate to step up and start against Romania in London, easing the burden on Munster playmaker Murray.